Lace print long scarf, not a thick scarf, but cozy and large enought to keep you warm in winter. Perfect for a casual look or any occasion! It is a must-have for all the seasons and nice gift for your family members and friends. Whether you are in artist style, boho-chic style, gypsy style, bohemian style or hippie style, it can add any style to your outfit. - Size: 70.8"Lx35.4"W (180CMx90CM), cozy warm and comfortable. 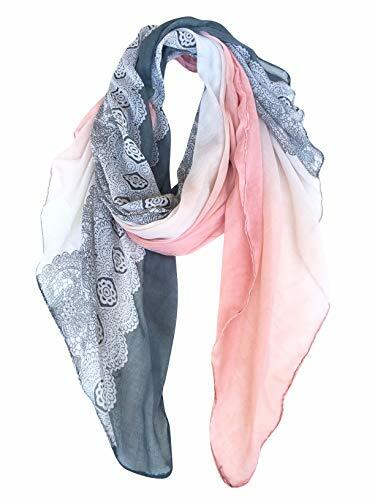 - Nice long scarf with lace, sewn from lightweight and soft voile fabric, can be worn all year round in all weathers. If you are looking for something different and fashion, this is it !!! Fashion lace print pattern on the fabric! Just lovely ... Very lightweight and nice, perfect for any occasion! NOTE：Please wash before you first dress because there maybe exists a little floating color. But rest assured that it will be ok after your first washing. If you have any questions about this product by GERINLY, contact us by completing and submitting the form below. If you are looking for a specif part number, please include it with your message.